Moist and succulent, this recipe for honey-lemon glazed salmon fillets with lemon-dill butter is an easy entrée. The lemon-dill compound butter is perfect with these salmon fillets. Salmon is one of my ‘go-to’ choices any time I need to put a quick dinner on the table and today we are broiling wild Alaskan sockeye salmon fillets with a honey-lemon glaze and a compound butter of lemon and dill. Compound butter is basically butter mixed with any other flavors such as shallots, garlic, fresh herbs, zests of lemons or any creation you dream up. It is mixed together, shaped and wrapped in parchment paper or plastic wrap and stored in the fridge until needed. 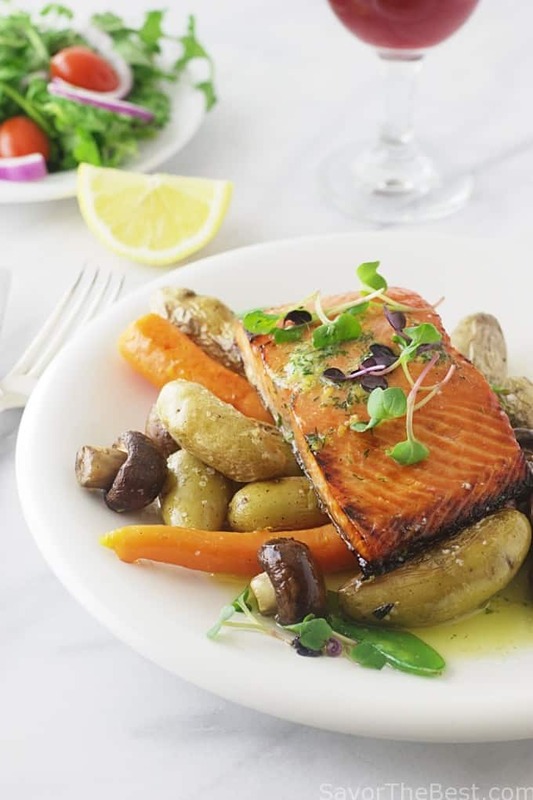 Compound butter adds a rich, flavorful topping to warm veggies as well as meats or in this case on our lovely honey-glazed sockeye salmon fillets. Sockeye is Don’s favorite salmon and this entrée of broiled honey-lemon salmon fillets with lemon-dill butter will put a smile on his face. 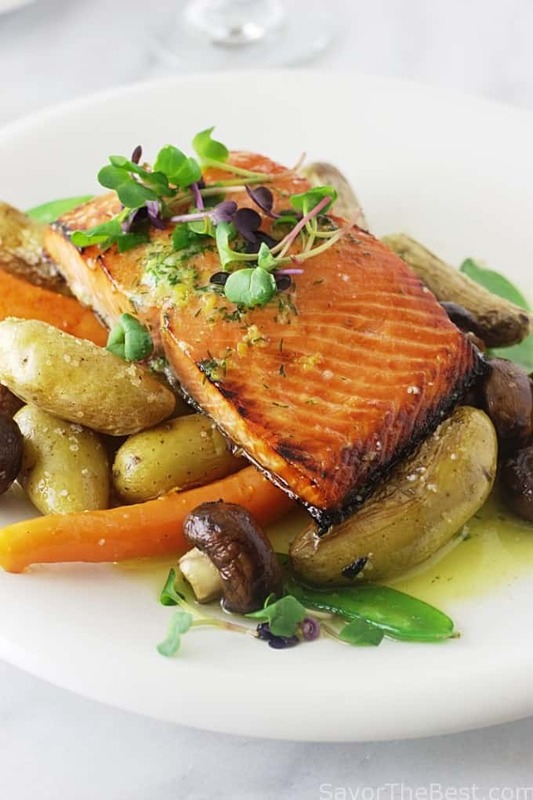 The cold waters of the Pacific Northwest has a great supply of wild sockeye salmon. 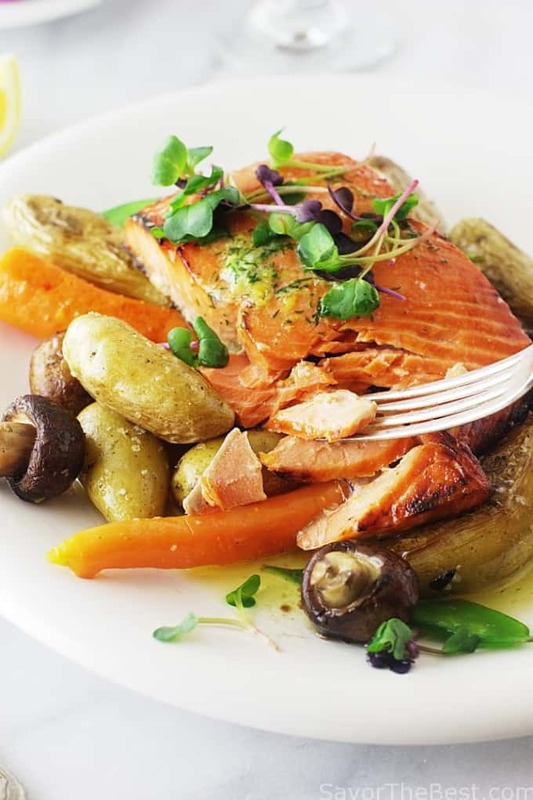 This delicious salmon is a fatty fish, rich in the Omega-3 healthy fat and has a firm deep reddish-orange flesh. Generally, sockeye’s do not grow to be larger than 6 or 8 pounds. 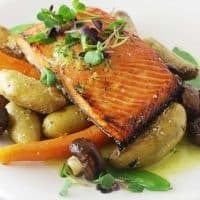 This is a quick and easy entrée as most sockeye salmon fillets will range about 1-inch thick and it will broil up in 6 to 8 minutes. We brushed a tangy honey-lemon glaze on the fillets that browns up beautifully under the broiler. 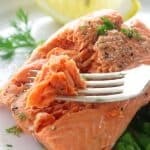 A thin slice of lemon-dill butter is placed on top of the fillets just before serving and as it melts it oozes down the salmon for a taste sensation. 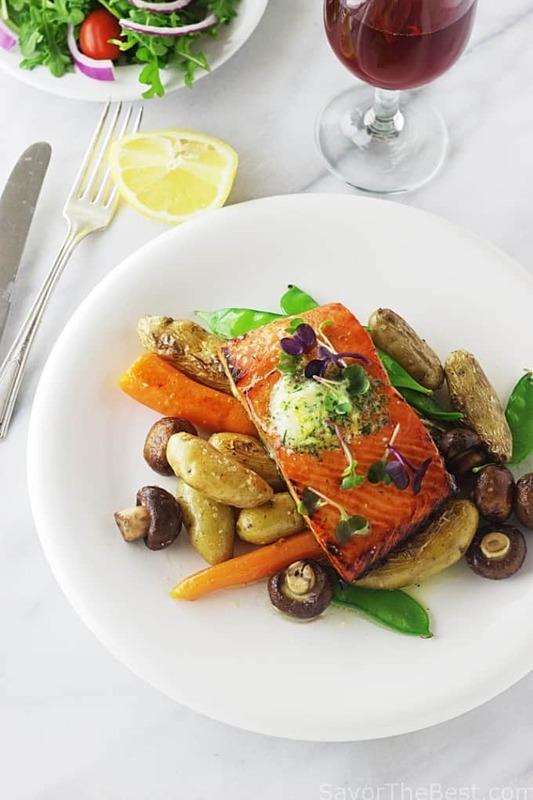 We have paired these sockeye salmon fillets with pan-roasted fingerling potatoes, whole baby carrots, mushrooms and snow peas. Plus a nice bottle of Pinot Noir wine. Tender salmon fillets with a honey lemon glaze and lemon-dill butter. In a small dish, add the butter, dill and lemon zest. Use a spatula to combine all of the ingredients well. Transfer the mixture onto a piece of parchment paper. Roll into a log and twist the ends shut. Place in the refrigerator for 2 hours, or until the butter is firm. In a small dish, add the honey, lemon juice, grated garlic, salt and pepper. Stir to combine. Preheat the broiler for at least 5 minutes, coat a baking sheet or broiler pan with non-stick spray. 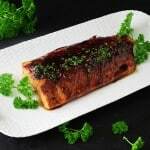 Place the salmon skin side down on the baking sheet and using a pastry brush apply a coating of the glaze to each fillet. 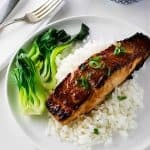 Transfer the baking sheet with the salmon to the oven and broil 6-8 minutes, or until fish flakes easily when tested with a fork and is still a bit translucent when flaked. Do not over cook. To serve, transfer the salmon fillet to individual serving plates and place a thin slice of the lemon-dill butter on each serving. Garnish with microgreens or snipped dill.